Waterproofing failure in buildings comes at a huge cost and the extent of damage is often extreme. To kick off this cover story, Dimi Kyriakou speaks to members of the waterproofing industry to find out where builders are going wrong in this area and their recommendations for best practice. According to the insurance industry, waterproofing failure is one of the biggest dollar-item claims. It is also a major cause of residential building disputes due to failed or poorly installed water membranes to shower recesses, balconies, rooftops and other wet areas. Disputes aside, it can also be very costly for a builder to identify the source of the water ingress and fix the problem, which can severely affect your reputation and your bottom line. The work involved to rectify the issue is not always straightforward either: it often involves destructive investigation, the cost of all remedial works and rectifying all damages caused by the water ingress. The contractor may also be held accountable for any of the owner’s financial costs if it is determined that their work was at fault. This makes waterproofing one of the most complex of trade issues and arguably the biggest problem facing the industry – this is supported by the number of companies that exist solely to fixing waterproofing failures. So where are the mistakes being made and how can you prevent these recurring issues from appearing in your project once it has been signed off ? The Australian Institute of Waterproofing aims to bring professionalism into the waterproofing industry and train people in the appropriate methods of waterproofing in buildings. Chairman Barry Tanner says that, given the potential damage that a water leak can do to a building, it is not a process that any tradie should take lightly. “There are many civil disputes as well as millions of dollars paid out each year from insurance companies for claims on water ingress in buildings,” Barry explains. Angus Kell is a qualified architect in New South Wales and the manager at CSR DesignLink. He is adamant that before builders even set foot onto a site, they should have a good understanding of the minimum requirements within the National Construction Code (NCC) and relevant Australian Standards, as they are responsible for ensuring compliance on both a national and state level. “This means having an understanding of the surrounding materials. It’s not just the waterproofing compounds themselves, but also the substrate and finishes,” he explains. Even now, much confusion arises from the ‘water resistant’ versus ‘waterproof’ debate. The easiest way to look at it is that a water resistant product or material will be able to withstand minor splashing, whereas a waterproof product or material will act like a plastic bag that won’t allow water to deteriorate it. Getting the two confused can often lead to the inappropriate choice of substrate, which Angus says is detrimental to the overall waterproofing installation. Another issue surrounds a lack of understanding in how water enters building and how it should be dealt with. This often leads to inadequate falls, which can mean that water ponds behind a toilet or even goes out the bathroom door to the rest of the building. And before you laugh and think it’s ridiculous for anyone to do that, Angus says mistakes like these happen more often than not. “You see these cases all the time and funnily enough in high rise construction, if you ask any of the builders they’ll tell you that waterproofing bathrooms is one of their major defects. It only takes one tiny little thing to send the whole installation into disarray,” he says. In line with modern trends, hobless showers can also present problems when waterproofing. One continuous wall finish – particularly if there is no full shower screen – means that the water itself can escape the enclosure much easier. 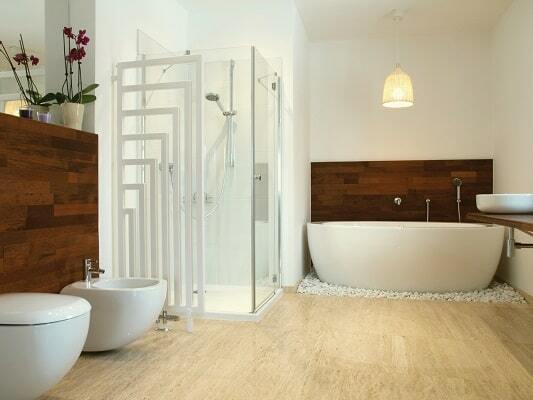 Connection detailing between a bath and the surrounding tiles between the wall and floor is also important. “We see that in showers where the base and the wall have a failure, or the wall to wall detailing has a failure,” Barry explains. “It is also common on balconies where they connect to the buildings through the door threshold or through the window and that fails. We see failure between sheet joints on floors because they are not properly supported. These are the main problem areas.” Angus notes that a classic example of where waterproofing work is brought into jeopardy is when doorstops are fixed to the bathroom floor to prevent the handle breaking the tile in full height tiled bathrooms. “The problem occurs when someone screws the doorstop through the floor and straight through the waterproofing membrane. You can buy doorstops that are fixed to the tile and not the floor – so that’s a simple thing to avoid. Clearly, there is a wide and varied range of waterproofing membranes that can be applied to any building. However, Angus suggests that, first, it is best to use a fibre cement-based flooring product for the substrate, which can be found in the CSR product line alongside many other reputable manufacturers. Given the wide option of waterproofing products available, Angus says it is essential to consider the compatibility of your chosen waterproofing membrane with surrounding materials, including the substrate and finishes. “It’s one area where people often try to save a bit of money. I recommend that you use the best product you can afford to use. Spending a little more money upfront for a more reputable product will save you a lot more in rectification costs to fix defects down the track. 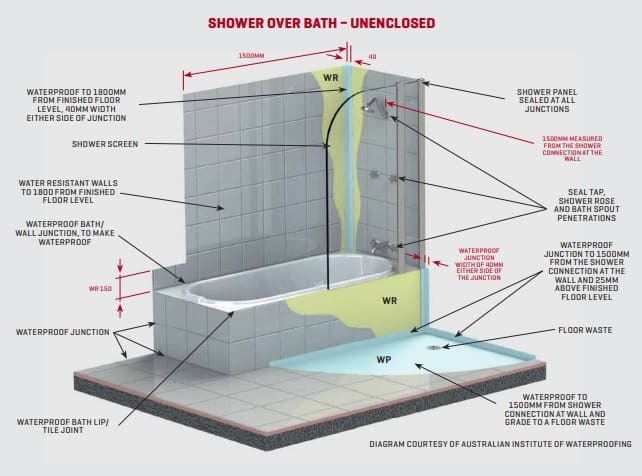 Given the easy access to manufacturer detailing and notes on the installation of their products, as well as the requirements within the NCC, Australian Standards or state-specific requirements, it may be tempting for builders to do the waterproofing themselves. However, both Barry and Angus recommend using a licensed waterproofer to do the job, as most states now require a certificate of installation to be provided by the contractor to show that the work complies. Given this, Barry says that many builders who choose to become a licensed waterproofer will contact the AIW to put them in touch with relevant courses through Registered Training Organisations. “I think to do the job you should have a trained, professional waterproofer who is certified and licensed to do and apply waterproofing. The builder needs to understand the methodology of how waterproofing is applied and how to prepare the substrate and prepare the building itself to receive the waterproofing. Builders and certainly waterproofers do have to understand movement and the control of movement in buildings, so we need to train them to understand that,” he says. You could say that waterproofing is a black and white trade, simply because something is either waterproof, or it’s not. As Angus summarises: you should plan for the worst and hope for the best.